Rome (Italian and Latin: Roma) is the capital city of Italy and of the Lazio region. 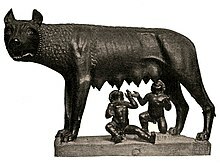 According to legend, the city of Rome was founded by the twins Romulus and Remus on April 21, 753 BC. It has been nicknamed Caput mundi ("capital of the world"), la Città Eterna ("the Eternal City"), Limen Apostolorum ("threshold of the Apostles"), la città dei sette colli ("the city of the seven hills") or simply l'Urbe ("the City"). If you are at Rome live in the Roman style; if you are elsewhere live as they live elsewhere. St. Ambrose to St. Augustine. Quoted by Jeremy Taylor, Ductor Dubitantium, I. 1. 5. Reported in Hoyt's New Cyclopedia Of Practical Quotations (1922), p. 677. When I am at Rome I fast as the Romans do; when I am at Milan I do not fast. So likewise you, whatever church you come to, observe the custom of the place, if you would neither give offence to others, nor take offence from them. Another version of St. Ambrose's advice. Reported in Hoyt's New Cyclopedia Of Practical Quotations (1922), p. 677. Despise this union of discordant races! To defend oneself by alliance is proof of cowardice. When I am at Rome, I fast on a Saturday: when I am at Milan I do not. Do the same. Follow the custom of the church where you are. St. Augustine gives this as the advice of St. Ambrose to him. See Epistle to Januarius, II. 18. Also Epistle 36. Reported in Hoyt's New Cyclopedia Of Practical Quotations (1922), p. 677. Common paraphrase of the above. And she the vanquished is, and vanquisher. Tiber; and that too hastens to be gone. And rivers, which are still in motion, stay. Joachim du Bellay, Antiquitez de Rome (third stanza of this poem taken from Janus Vitalis). Translation by William Browne, from a Latin version of the same by Janus Vitalis, In Urbem Romam Qualis est hodie. See Gordon Goodwin's ed. of Poems of William Browne. Translation also by Spenser, in Complaints. Reported in Hoyt's New Cyclopedia Of Practical Quotations (1922), p. 677. Robert Browning, Ring and the Book, V, 296. Reported in Hoyt's New Cyclopedia Of Practical Quotations (1922), p. 677. Robert Burton, The Anatomy of Melancholy (1621), III. 4. 2. Lord Byron, Childe Harold's Pilgrimage, Canto IV (1818), Stanza 78. Lord Byron, Childe Harold's Pilgrimage, Canto IV (1818), Stanza 145. George Gordon, Lord Byron in Childe Harold's Pilgrimage (1812). Augustus Cæsar to Piso. See Plutarch, Apothegms. "Eternal Rome" said by Tibullus, II. 5. 23. Repeated by Ammianus Marcellinus—Rerum Gestarum, XVI, Chapter X. 14. Reported in Hoyt's New Cyclopedia Of Practical Quotations (1922), p. 677. Miguel de Cervantes, Don Quixote. Reported in Hoyt's New Cyclopedia Of Practical Quotations (1922), p. 677. Miguel de Cervantes, Don Quixote, 2, 13, 55. Reported in Hoyt's New Cyclopedia Of Practical Quotations (1922), p. 677. Proditor unus iners angusto tempore vertit. Claudianus, In Rufinum, II. 52. Reported in Hoyt's New Cyclopedia Of Practical Quotations (1922), p. 677. A great civilization is not conquered from without until it has destroyed itself within. The essential causes of Rome's decline lay in her people, her morals, her class struggle, her failing trade, her bureaucratic despotism, her stifling taxes, her consuming wars. Will Durant, Caesar and Christ (1944), Epilogue, p. 665. Edward Gibbon, The History of the Decline and Fall of the Roman Empire (1776). Johann Wolfgang von Goethe in Italian Journey (1816). Edward Gibbon, History of the Decline and Fall of the Roman Empire (1838), chapter 2, third paragraph from the end, p. 32. Veuve d'un peuple-roi, mais reine encore du monde. [Rome] Widow of a King-people, but still queen of the world. Gabriel Gilbert, Papal Rome. Reported in Hoyt's New Cyclopedia Of Practical Quotations (1922), p. 677. Rome was ruined more by neglect of agriculture, and giving no attention to useful trade and commerce, than by the invasion of barbarians. Walter Harte Essays on Husbandry (1764), p. 11. Felicia Hemans, Roman Girl's Song. Reported in Hoyt's New Cyclopedia Of Practical Quotations (1922), p. 677. Fumum et opes strepitumque Romæ. Cease to admire the smoke, wealth, and noise of prosperous Rome. Horace, Carmina, III. 29. 11. Reported in Hoyt's New Cyclopedia Of Practical Quotations (1922), p. 677. Never before has any city in the world had so a wonderful adventure. Its history is so big that even the huge crimes it is littered with look tiny. Maybe one of the troubles of Italy is exactly this: to have a capital city that is disproportionate, for name and past history, to the modesty of a people that, when shouting "go for it, Rome! ", is only referring to a football team. In tears I tossed my coin from Trevi's edge. I gave to Rome my rendezvous and pledge. Oh, let me join the faithful shades that throng that fount above. Robert Underwood Johnson, Italian Rhapsody. Reported in Hoyt's New Cyclopedia Of Practical Quotations (1922), p. 677. Crurent, pouvoir choisir des sentiers différents. Jean de La Fontaine, Le Juge Arbitre, Fable XII. Reported in Hoyt's New Cyclopedia Of Practical Quotations (1922), p. 677. Juvenal, Satire III, John Dryden, trans. Alaine de Lille in Liber Parabolarum (1175). Benito Mussolini, a phrase said after marching on Rome in 1922. Exaudi, regina tui pulcherrima mundi, inter sidereos, Roma, recepta polos! Exaudi, genitrix hominum genitrixque deorum: non procul a caelo per tua templa sumus. Te canimus semperque, sinent dum fata, canemus: sospes nemo potest immemor esse tui. Obruerint citius scelerata oblivia solem, quam tuus ex nostro corde recedat honos. Nam solis radiis aequalia munera tendis, qua circumfusus fluctuat Oceanus. Volvitur ipse tibi, qui continet omnia, Phoebus eque tuis ortos in tua condit equos. Te non flammigeris Libye tardavit arenis, non armata suo reppulit Ursa gelu: quantum vitalis natura tetendit in axes, tantum virtuti pervia terra tuae. Fecisti patriam diversis gentibus unam; profuit iniustis te dominante capi; Dumque offers victis proprii consortia iuris, Urbem fecisti, quod prius orbis erat. Listen, beautiful queen of your world, that is welcome among the stars, Rome! Listen, mother of men and mother of gods: thanks to your temples we are not distant from the sky. We sing at you and we will always sing, until fate will allow us: no man can forget you until alive. A guilty oblivion will clear the Sun before our veneration will vanish from our hearts. Like sunbeams, you extend your benefits into the world surrounded by the floating Ocean. Phoebus himself, who surrounds and illuminate the whole world with his light, travels in your honor: from your lands he rises, in your lands he sets. The flaming sands of Lybia didn't obstacolate your path, neither the Ursa armed with its frost: as much as living nature extends towards the poles, so is shown the virtue of your lands. From different people you made one country; the unlawful gained advantage from your dominion; when you offer to the vanquished to be part of your law, you made City what before was the world. Latin in Palingenius (1537). Beaumont and Fletcher, Little French Lawyer, Act I, scene 3. Same idea "No se ganó Zamora en una hora.—Zamora was not conquered in an hour." Cervantes, Don Quixote, II. 23. Reported in Hoyt's New Cyclopedia Of Practical Quotations (1922), p. 677. The very Tombs now vanish'd like their dead! Alexander Pope, Moral Essays, Epistle to Addison. Reported in Hoyt's New Cyclopedia Of Practical Quotations (1922), p. 677. Whence this excess of joy? What has befallen me? And I spring up as girt to run a race! Samuel Rogers, Rome. Reported in Hoyt's New Cyclopedia Of Practical Quotations (1922), p. 677. William Shakespeare, Julius Cæsar (1599), Act IV, scene 3, line 27. New Rome will be destroyed by the attacks of new vandals. Dejan Stojanovic in Circling, ”New Vandals,” Sequence: “A Warden with No Keys” (1993). Suetonius. Life of Caligula ascribes it to Caligula. Seneca the Younger and Dion Cassius credit it to the same. Ascribed to Nero by others. Reported in Hoyt's New Cyclopedia Of Practical Quotations (1922), p. 677. Henry David Thoreau, in "Walking" (1862). Mark Twain in The Innocents Abroad (1869). The teacher reminded us that Rome's liberties were not auctioned off in a day, but were bought slowly, gradually, furtively, little by little; first with a little corn and oil for the exceedingly poor and wretched, later with corn and oil for voters who were not quite so poor, later still with corn and oil for pretty much every man that had a vote to sell—exactly our own history over again. Mark Twain, "Purchasing Civic Virtue," Mark Twain in Bernard DeVoto, ed., Eruption (1940), p. 68–69. Li Proverbe au Vilain (ca. 1190). Virgil , Aeneid, Book XII, line 827.